“My recent work interprets the past as a personal, cultural, and archetypal artifact. The human body, architectural unit, and surrounding landscape become metaphors in my work. Trained as a traditional printmaker, I am intrigued by the richness and variety inherent in varied techniques. Susan Fecho, a Professor of Art at Barton College, has shown in 25 solo exhibitions and over a hundred invitationals. Fecho’s published images have been accepted into several major collections: the Smithsonian Institution’s American Art Museum/National Portrait Gallery Library, Washington, D.C.; the Word and Image Department, Victoria and Albert Museum, London, England; and the Museum of Women Artists, Washington, D.C. Fecho is a multi-media printmaker/surface designer with an earned M.F.A. from East Carolina University as well as postgraduate studies from various institutions including; Jan Van Eyck Academie, Humboldt Field Research Institute, Milwaukee Institute of Art and Design, Northern Illinois University and Penland School of Crafts. 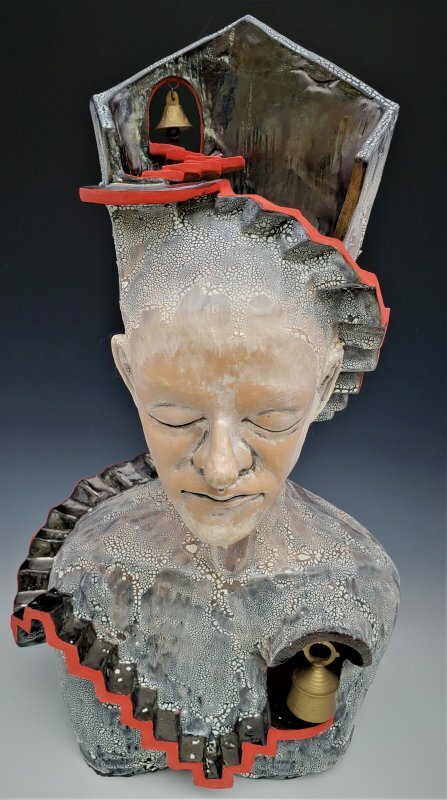 She has exhibited regionally, nationally and internationally – and has received numerous awards, grants and residencies. Olga Yukhno is an artist originally from Pyatigorsk, Russia. It was in Russia her passion for art began. Inspired by the culture of her home country, she began by working with batiques, stained glass and enameling. She studied under world renowned enamellist, Nikolai Vdovkin for several years to hone her skills, before moving to the United States in 2008. In the US, she no longer had access to the tools needed to continue with her enameling, and quickly started expanding into any and every new medium she could get access to. What she fell in love with was ceramic sculpting. 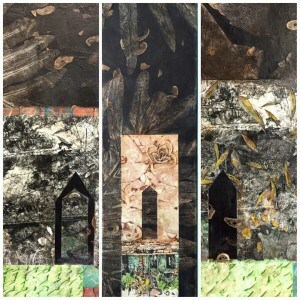 It allowed her to experiment, and fuse together old-world artistry with her skills and abilities across a wide variety of art forms to create totally new and unique mixed media pieces. “The concept for this exhibition comes from my fascination with human psychology, and my drive to translate it into art. How do we come to a given conclusion, or arrive at a certain decision? How do we deal with difficult situations, when we are at a crossroads, or put into a scenario we never thought we would be faced with? How do we handle trauma? What kinds of coping mechanisms do we develop? “The pieces in this show address some of the hardest aspects of our lives: facing our fears, denial, peer pressure, societal and personal expectations. I look at what role society plays in our lives, how it can be a force of good to mold us, but also how it dictates what we think, gags what we say and prevents us from being who we are inside. “I also explore the pursuit of what makes you uniquely “you”, uncover things we sometimes don’t even know ourselves. What informs our life choices? What are we willing to give up? How do we know if it was the right decision?